9" Dual PS2 to USB Adapter - NWCA Inc. Convert your USB port into PS/2 ports! This USB to Dual PS/2 Adapter is the answer if you have an extra PS/2 keyboard and/or mouse, and want to use them with a computer that only has a USB port. This adapter supports PS/2 keyboards and mice, yet uses only one USB port! 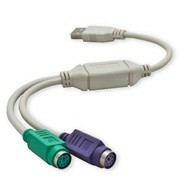 Order your USB to Dual PS/2 Adapter today!